Wendy Osserman and Danielle Madrid are modern dancers and choreographers living in Oriental and New Bern. They will perform Mother Land, a suite of new dances, on Thursday May 9, 7:30 PM at the Stanly Hall Ballroom in New Bern. 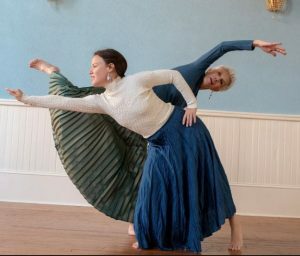 The program features choreography to Sephardic (Spanish Jewish) music and a duet in which the performers use words and movement to muse on motherhood. The program lasts approximately one hour and is appropriate for all ages. Tickets: $15 at the door.